Our biogas process takes just 40 days and is chemical free, avoiding polluting the atmosphere and land. We can process all bio-degradable food and drink waste, including packaged products, and Category 3 animal by-products. By creating electricity from food waste, Anaerobic Digestion (AD) is a sustainable, cost-effective alternative to fossil fuels. Anaerobic Digestion (AD) is a natural, clean, ‘green,’ environmentally friendly process generating electricity from food waste and food processing residues. The renewable electricity generated through this process helps combat climate change. By sending food waste to our biogas facility, waste to landfill is reduced and greenhouse gas emissions are therefore reduced. It’s easy to do and a great benefit to our environment. Landfill is a waste – biogas is a resource. Already in use on over 100 Scottish farms, our Energro liquid fertiliser is a nutrient-rich product which offers a highly cost-effective alternative to inorganic fertilisers. Find out more about Energro. In addition to the reduction in landfill disposal costs, Anaerobic Digestion is a carbon positive and odour free process with environmental benefits, namely an overall reduction in your greenhouse gas emissions. This helps your business to comply with government legislation and contribute towards global environment protection. 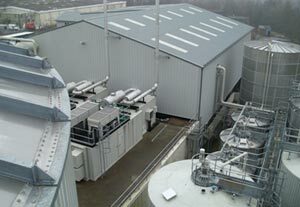 Our Anaerobic Digestion (AD) facility in Cumbernauld, Glasgow began receiving food waste during March 2011 and now generates enough renewable electricity to power more than 5,500 homes. We also supply local farmers with bio-fertiliser for more than 1,000 hectares of land.